I am mighty excited to participate in the blogging marathon edition # 7 for the very first time. I chose the easiest theme - Kids crunchy recipes. I call it easy not because it is my forte' but because this theme really excites me the most- considering that I have a two year old drooling at my feet whenever I am kitchen, it further inspires my creative genes. This being the day 1 of the marathon, I had to make something outside the comfort zone and challenging. Also, I tried to look in my kitchen for ingredients rather than shopping to be most innovative. I have a fresh corn pod sitting in my fridge. So, here I am making the lollipops. Lollipops are primarily to make it interesting for the kids. Else these are good to go as cutlets as well. 2) Roast the corn on gas stove until it is cooked well, should change color at the tip. 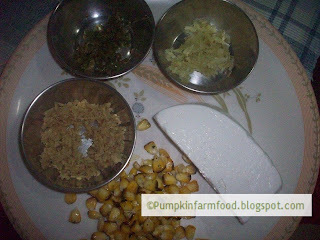 Now remove the corns from the pod and also seperate the husk. 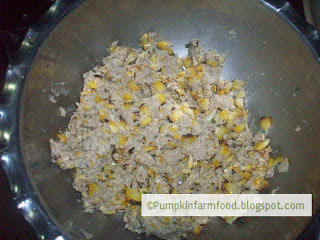 3) In a seperate bowl, mix the all of the remainingingredients with the corn and knead lightly. You should be able to form small balls with the mixture. 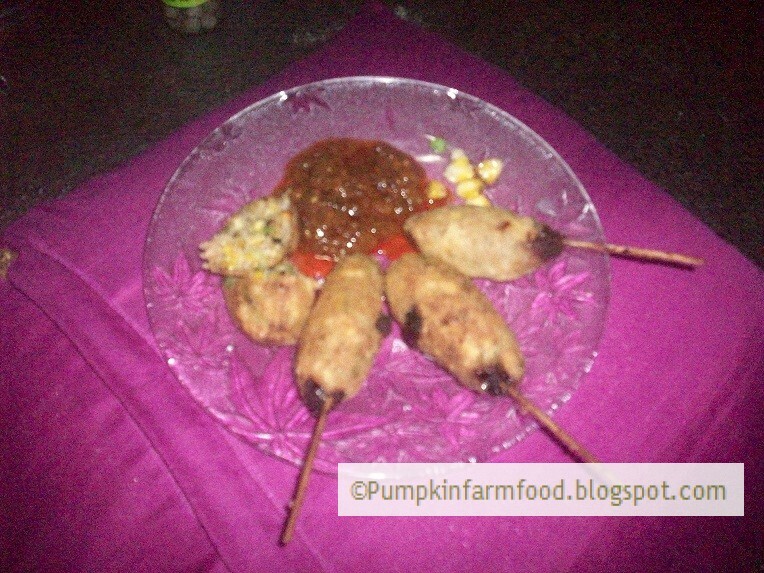 3) Now use the satay sticks or tooth picks (dipped in water) to form croquette shaped lollipops on the tooth picks. 4) Dip this stick in the flour batter and then drop them in hot oil in a frying pan. 5) Cook them on high flame until they turn golden in color. 6) Serve with your choice of sauce. I had peanut sauce with me so I served it along with it. My son loved the combination, hope you enjoy it too. The lollipops look so delicious. Welcome to BM.. I'm sure kids are going to love this. I too have a kid of same age and know how difficult its to please them. Looks very nice Pradnya..great to have you run the marathon..:0) I am sure your kid is going to enjoy the next 7 days along with us..
nice combo of corn n paneer! Wow .. love the lollipops .. my son would love this.